Do you want to relive your N64 childhood days or like older games and want to play Zork? How are we going to do this you say? Well, this tutorial is for you! We are going to build a RetroPie Gaming station using a Raspberry Pi. It will emulate almost every gaming system from DOS to Sega to N64. You can play any game from most consoles and have up to four players or more. I would also like to thank my MakerSpace FubarLabs for all the help making this instructable possible. Prices range is a ballpark estimate. Prices may fluctuate after this Instructable is published. Feel free to make substitutes to any part. Most parts can interchanged with higher or lower model as long as they serve the same purpose, THE ONLY EXCEPTION IS THE RASPBERRY PI 2 MODEL B. The Pi2 Model B has more horsepower and processing speed that is necessary to run power hungry games like Super Smash Brothers and Perfect Dark. I will list the general steps for upload a image to a Micro SD card, since the RetroPie and Raspberry Pi websites have great tutorials and resources. 1. Download the image from the RetroPie Website. This step covers all the plug and play parts for the RetroPie. 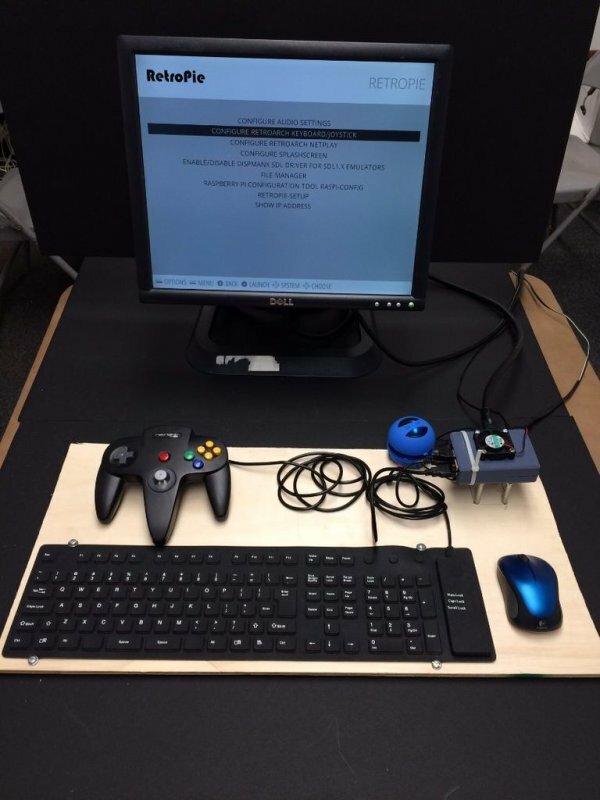 The RetroPie has two sets of configurations for a controller. One for browsing in the menu while you select a emulator to run and another for when a ROM is running. I will go through both. Once the emulation installs and brings the emulator selector screen up, press the letter a button on the keyboard and you will get the following screen, choose configure input and show the name of the controller connected, press enter and it will go through a series of prompts where you push a button to correspond with each button. To configure in game, press the left arrow on your keyboard or press the analog stick left or D-pad till you get to RetroPie and press enter, scroll down till “CONFIGURE RETROARCH KEYBOARD” In the same fashion, it will go through all the buttons and you press the button on the controller to correspond to that button. To upload ROMS to your retropie to need to use a file transfer program, we will be using Filezilla. Google it and download the Filezilla program. Open the program and press new connections on the upper right. Press New connections and input a name for the connection, i.e. RetroPie 1 (you many need to make a few connections and adding a numbers helps keep track). Now go to RetroPie and press F4 on the keyboard. Then any key to stop the timeout from going back to the emulator. Press startx, this will start the linux OS and bring you to cmd prompt, it will also list vital information about your Pi including IP address which is what we need. Input this IP address into Filezilla and for user name put the same username and password you used to start your Pi. (pi and raspberry if you haven’t changed it). Once you filled in the information press save and then connect. If it’s successful (it will tell you), you will bring up the folder directories of the Pi starting with root. Open the folder and then open the folder called RetroPi. Then roms which each emulator has a separate folder. Either drag and drop your files or locate them on the left and press send to transfer your ROMs to your RetroPie. You may need to reset your Pi after the transfer is complete for the emulator to see the ROMs and or use ROM scraper in the emulator menu to refresh the ROMs in the emulators. Step 6: Overclock the Pi! To run the high demand games on the RetroPie like N64m you need to overclock the pie and have a Pi 2. The other emulators are less power hungry so you will may get by with a less powerful Pi, depending on the games you want to play. After you load your RetroPie, press F4 and another button to stop the timeout from bringing you back to the emulator. Type in the command “sudo raspi:config”. This will open up a menu with hardware settings for your Pi. Go to overclock and set the Pi to the maximum overclock; we will be adding air cooling and heat sinks to the Pi. Do this step at your own risk and only if you need to overclock your Pi. Overclocking can lead to damage to your Pi or even bricking your Pi without the proper setup and care. I nor can this guide be held responsible for any damage that occurs to your pie in using this guide or setting up RetroPie on your Raspberry Pi. READ Host your Smartphone App on your Raspberry Pi! 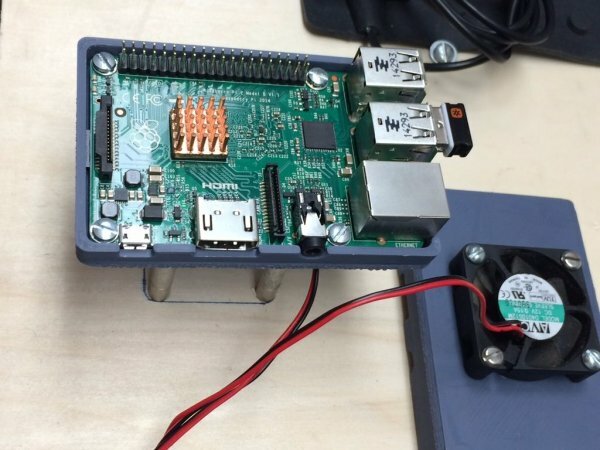 You may use any Raspberry Pi enclosure that fits the particular Raspberry Pi model you have. Each model has different clearances and shapes so one enclosure might not fit right for another model. The main thing the enclosure you use is that it has a bottom and a top and that you can cut a square and drill holes into for mounting the fans. You may also use this case that has a PC fan integrated into the case. You can print the enclosure with your own 3D printer or you can go to your local makerspace and ask for assistance in printing your enclosure. You can also pay a 3rd party company to print a case for you. If you choose to print it yourself or at a makerspace, be sure to print it using a fine or slow setting to ensure the highest amount of accuracy and smoothness as the edges of both and the top of the enclosure need to be exact so that they fit flushly. You can choose any color you want. In this guide the enclosure was made with a material called HIPPS. You may use other materials like ABS and PLA, as long as the part is strong enough to handle drilling into and screwing part to. Note: you may want to print a extra enclosure incase the first one breaks or make a mistake.